Okay, so I couldn't make this volume last me the four months it will take to get the next one. But, hey, if you were left on that cliffhanger at the end of the previous volume than you'd gobble this one up quick as can be, too. So if you haven't read the series, hate spoilers, and think you might want to read them then stop reading this and go pick up those manga! At the end of the previous installment Yuki was hit by a car. Not too badly since she was able to walk away, but she did have a few scrapes and bruises. Plus it's still a car! Worse still, she seemed to have suffered a bit of a personality change. Now this is where we sort of have a temporary joining between the Nagato of The Disappearance of Nagato Yuki-chan and the Nagato of The Melancholy of Haruhi Suzumiya. 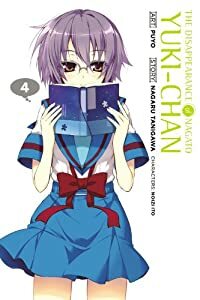 While the previous volumes didn't make it mandatory for you to be familiar with the light novels, anime, or manga, volume four really does require a bit of familiarity with the original series (at least with the original Nagato) to really make this volume work. By that, I mean that the story that the series has been building up so far (the romantic comedy stuff) is kind of put on halt and this alternate story is briefly introduced and then concluded. Really, we have a cameo from the Nagato of The Melancholy of Haruhi Suzumiya in the body of the Nagato from The Disappearance of Nagato Yuki-chan. So the Nagato we see in this volume is really different from either Nagato, but still similar to both because they do share many of the same features and characteristics. Being familiar with the light novels, it is tough to think of when the Nagato of the light novels might have made a journey to this other world in the manner that she did. I am not saying it isn't possible, but based on what I do know I have got to assume that this volume isn't canon to The Melancholy of Haruhi Suzumiya even though it features a major character from it. Otherwise, well, this volume leaves quite a few questions that The Melancholy of Haruhi Suzumiya needs to answer in order to make this crossover "official." And I don't think that is going to happen. Instead, I would like to just chalk this volume up to being a short and sweet merging of the Nagato characters. Unless there is some sort of explanation down the line from The Melancholy of Haruhi Suzumiya side that can explain Nagato's sudden transfer to another world. Or maybe there is a possible scenario in the manga, but I wouldn't know since I haven't read it. In other words, this is Tanigawa just giving us a wink. But as much as I hate to say it, this volume feels more like a detour (albeit a very good one) than a legitimate follow-up to the story that has been progressing thus far. This series has been trying to remain independent of the other (with the exception of a few sly references... more Tanigawa winks, I suppose you could say), but not so much here. It's all good, though. I really liked this issue. Even if it did seem devoid of Haruhi, Tsuruya, Mikuru, and Koizumi. And even Nagato in a way. This issue really is all about Nagato and how she deals with these memories that don't seem to be hers, but somehow are.